Sometimes you'll need a quilt in a hurry. When that happens you need a block that can be your go to quilt block. The disappearing nine patch or tossed nine patch can be that block. It's so simple to do, can be done with any size square, and looks like you did a lot of piecing. I'm only showing you one block that ends up being 17 and half inches but you can get really creative with the layout when you have multiple blocks. Using my disappearing nine patch dimensions you only need twelve blocks to make a full-size quilt. 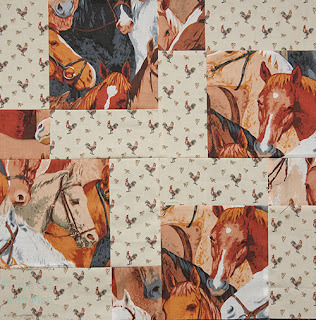 So let's make a tossed nine patch quilt block. You may be asking yourself why I kept switching between calling it a disappearing nine patch and a tossed nine patch. The answer is simple. I grew up knowing the block as a tossed nine patch but most people today call it a disappearing nine patch thanks to Jenny Doan. Many quilt blocks have more than one name but I try to use as many of the names I know so that no matter what you call it we are all on the same page. That's all you need two fabrics. I wasn't looking at what was on the fabric when I pulled it, I was focused on tonal properties. I knew the overall sampler quilt needed something a little more neutral going on it. We've got a lot of color going on in the quilt, some very bright, that we will need a few more demure blocks in the overall piece. 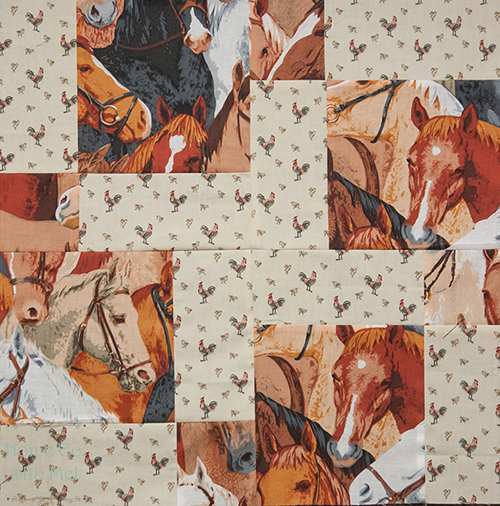 Once I had everything pulled and cut I realized that I had pulled horse fabric and chicken fabric. As many of you know I live in a very rural area. I'm in a town of 400 and I literally have horses and chickens as neighbors. 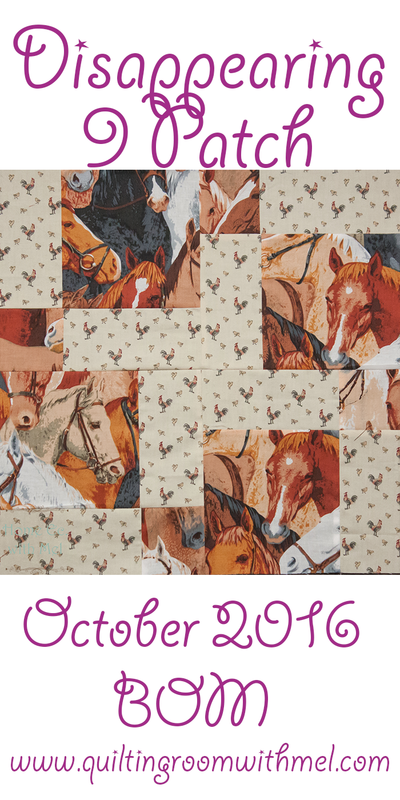 If you are keeping track at home I've now used sheep, pigs, horses, and chickens in this sampler quilt. I think the country girl is slipping out more than I intended. I didn't demo how to sew a nine patch. We all know how to sew a nine patch it is what we started with when we first started to quilt. This is the shortest video I've done on a quilt block since I started doing these demos. The block really does go that quickly. From the time I started cutting fabric until it was hanging on the design wall for the video was about 15 minutes. That breaks down to three hours for a full-size quilt top. I hope you make a bunch of these up for gifts. Don't forget to sign up for the BOM newsletter.